A reward of up to $30,000 has been established for information leading to charges in connection with the destruction of 10 acres of papaya trees in Puna in July. On the morning of July 19, Puna patrol officers responded to a report that trees in three adjoining papaya fields in the Kapoho area had been cut down. Each property belonged to a separate owner. 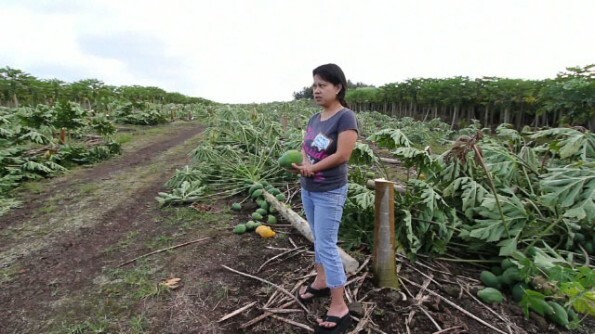 Additional adjoining papaya fields were left undamaged. The scene, near the area where 8,500 trees were destroyed a year earlier, is located on Alohilani, about one mile north from where it intersects Route 132 near the 6-mile marker. The trees appeared to have been chopped down with a machete sometime between July 18 and July 19. The reward is being jointly funded by the Hawaiʻi Crop Improvement Association, the Hawaiʻi Papaya Industry Association and the Hawaiʻi County Office of the Mayor. Police ask that anyone with information about this case call Detective Brandon Konanui at 961-2340 or the Police Department’s non-emergency line at 935-3311. Citizens may call the Police Department’s Kuleana Hotline at 961-2219 if they have information that this crime might have been an act by any organized group. See related video of the destruction here.